Flat Rock is a 4+ mile trail (both ways) that can be found in Tuscarora State Forest, with the trail head located at Colonel Denning State Park. This is a moderate-to-rugged hike, climbing in elevation over 900 feet with rocks and loose gravel. At the top of the mountain, Flat Rock Trail joins the Tuscarora Trail to the overlook. 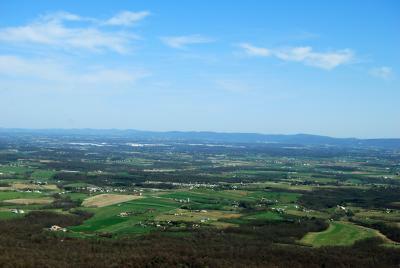 Flat Rock Trail overlook is a natural rock outcrop that affords a 180-degree spectacular view of Cumberland Valley. In the fall, enjoy the foliage and hawk migration from the Flat Rock lookout. View the map of Colonel Denning State Park here.